This article first appeared at American Lens News on October 24, 2017. 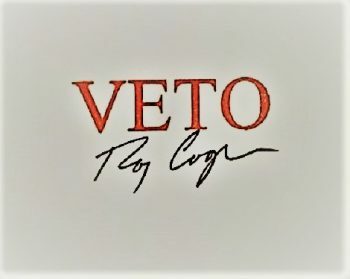 North Carolina’s Democrat Governor, Roy Cooper, is on track to break the veto record held by former Democrat Governor Beverly Perdue. During her one-term tenure, Perdue had 20 vetoes – 19 in one year. Republican Governor Pat McCrory had 6 over his one term. Roy Cooper already has racked up 13 in his first 10 months. It wasn’t until 1996 that North Carolina granted the governor veto power. As a point of interest, the Tar heel state became the last state in the country to grant this power. Prior to bills being sent to the governor for signature, bills that were passed by the legislature became law when signed by the ranking presiding officers of the House and Senate. Cooper recently vetoed Senate Bill 656, which was promptly overridden by the legislature. Cooper found the bill controversial and called it an ‘attack on elections and the judiciary’ because the bill seeks to cancel the judicial primary in 2018 and adopt a system of electing judges every two years. The judgeship primaries affected are Justices of the Supreme Court, Judges of the Court of Appeals, Superior courts and district courts. House Elections and Ethics Law committee chairman David Lewis (R-Harnett) responded to Cooper. “This legislation makes needed, non-partisan reforms to our ballot access laws,” said Rep. Lewis. “It gives judicial candidates the time they need to analyze any forthcoming changes to judicial maps that the General Assembly may make”. Senate Bill 656 also lowers the percentage of votes needed to win crowded races and lessens the burden on unaffiliated and third-party candidates to get on a ballot. A three-fifths majority is required to override a gubernatorial veto. The Senate easily met that requirement and overrode the veto 26-15 last Monday evening. The House followed suit and cleared the 60% needed to override with a 72–40 vote. Both votes were virtually down party lines. In the House, however, Reps. William Brisson (D-Bladen) and Elmer Floyd (D-Cumberland) both voted to override the bill. This veto override is the 10th. The three other bills waiting for action are HB 205, HB 511 and HB 576. Given the record so far is it likely they will be overridden as well. House Bill 205, WC Changes/Legal Notice Modernization. House Bill 511, Game Nights/Nonprofit Fund-Raiser. House Bill 576, Allow Aerosolization of Leachate. Details on each of these vetoes and overrides can be viewed at the Legislature website. This entry was posted in Am Lens, NCGA, POLITICS NC, Roy Cooper and tagged Ray Cooper, Veto. Bookmark the permalink.